The New Year has begun and the gyms are packed. If there’s a company promoting any kind of way to help with weight loss, this is their time to shine! There are new goals ready and waiting to be achieved. There’s no doubt that this time of year brings attention to what’s going on both inside and outside of our bodies. Although focusing on physical weight would be much easier to blog about, I’d like to share a little about mental and emotional weight. Did you know that most women, who dealt with emotional baggage (weight) in their childhood, continue dealing with it as an adult? About 80% of 21 year olds that were abused as children meet criteria for at least one psychological disorder. * This is not an issue that we can overlook or ignore. For most of us, it’s the pink elephant in the room. It’s an issue that we’ve not been taught to deal with, leaving us totally ignorant. Some of us didn’t really recognize that something was wrong in our families until we became adults and started asking questions. Some are too afraid to ask questions because of what we may find. When we carelessly choose to ignore these warning signs, we are dancing in dangerous territory. 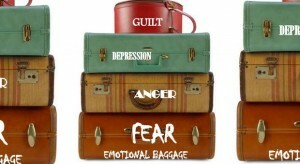 Instead of unpacking the baggage, we attract more of it causing more injury. We began to add on layers of stuff that wasn’t meant for us to bear. Then it becomes harder to unveil those layers, developing a tough shell. When the shell has hardened, it’s easy to block people out that need to be in and ignore others that try to help. When we take time to discover who we are, we can more readily acknowledge when there’s a problem or sense of uneasiness. We’ve got to first be willing to be honest with ourselves before we can begin the process of healing. More times than we ought, we try to find ways to cover up our hurt and pain and wish it away, but instead, it increasingly gets worse. When we make a decision not to deal with the issue(s) that have scorned us in the past, we make the decision to produce a generation of hurting, confused, disoriented and hopeless offspring. We continue to repeat a cycle of participating in bad relationships, recurring attitude problems and allowing ourselves to settle for whatever life brings us. We make bad decisions that ultimately affect those we care about and those that care about us. While we’re striving to have the best brick bodies a girl can have this year, let’s make time to be healthy mentally and emotionally as well. Let’s be okay with walking away from destructive relationships, asking questions about our family tree, and being aware of our own shortcomings. There’s freedom in authenticity. Kashonna Holland is a Speaker, Life Coach and Writer. With contagious energy, a vibrant smile, and straightforward message, Kashonna passionately and purposefully journeys alongside women from the point of breaking through the process of breakthrough – personally, professionally, and spiritually.